How to make a bias binding. 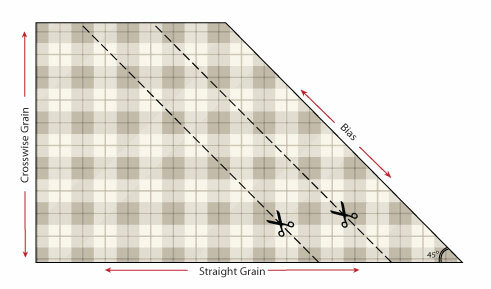 Bias binding is a widely utilized in all sorts of sewing projects. Its uses are far wider then just a hem finish. It can have decorative as well as functional purpose in a garment. Though the craft shops have a wide variety of ready-made bias tapes, they often are the wrong shade for the project, or not stocked in a particular width. Hence is a necessity to make your own. Luckily it is not hard to produce at home and gives your more control over the design. It is a useful technique to know either you a dressmaker or a quilter. Iron the piece of fabric you are going to make the bias tape with. Spread it flat in one layer. Do not allow it to hang over the working surface to avoid stretching. Mark the strips of a desired width. Remember that fabric cut on bias stretches significantly when steamed, so make sufficient allowance. Cut. Quilters can put a rotary cutter and a cutting mat to use to speed up the process. Continue reading How to make a bias binding.